We answered the call with this newly designed lifter made of T-1 alloy steel, high strength at a lighter weight than low carbon steel. 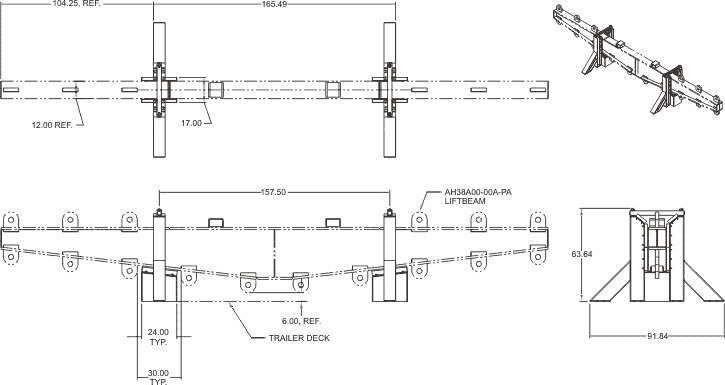 The lifter was proof tested in house to 300,000 lbs., not once but several times, so that each padeye was loaded. We also made a special cradle as requested by the Navy. This lifter is just another example of our versatility and capability! PROOF TESTED to 125% (300,000 LB) and certified. All padeyes tested in pairs. STANDARDS: Specification #EAD21000A applies. Designed to meet or exceed ASME B30.20 & BTH-1, Design Cat. B, Service Class 0. 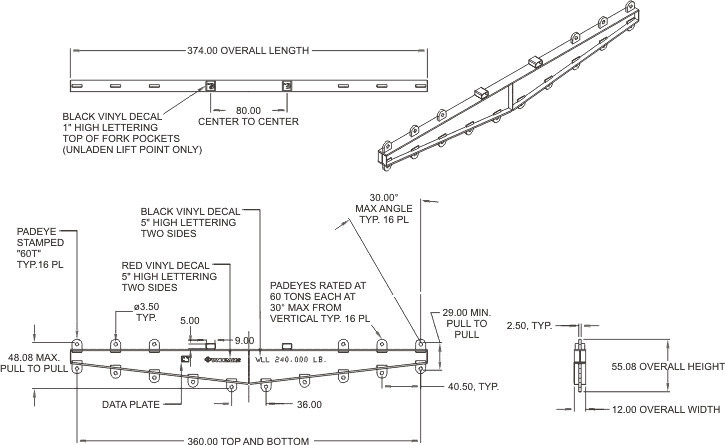 CUSTOM OPTIONS: Customized to your needs, inquire for other load capacities or sizes. The load should never exceed the working load limit (WLL) specified on the lifter and plate. The weight (wt) of the lifter and load should never exceed the rated capacity of the hoist or crane. The lifter should be operated by qualified personnel. The lifter including all rigging should be visually and mechanically inspected on a scheduled basis by qualified personnel. Defects should be corrected prior to use. Any modifications or repairs to the lifter should be made by qualified personnel. If this work is structural, the lifter should be proof or load tested again. The lifter should only be used for its designed or designated purpose, and in accordance with manufacture's instructions. Personnel should not ride on the lifter, nor place themselves in, under, or directly adjacent to the lifting area. 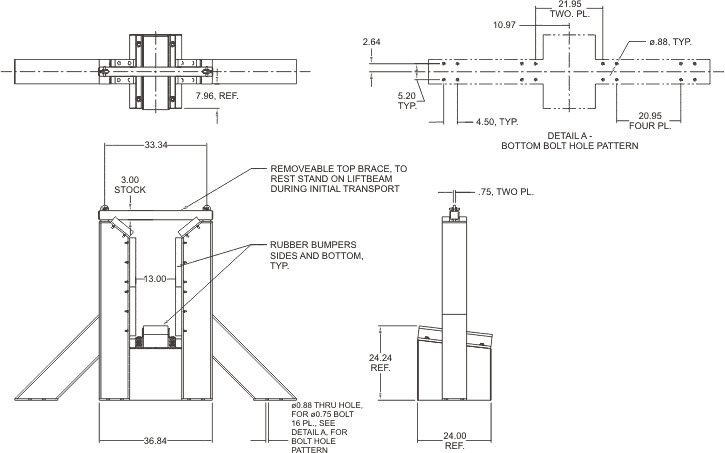 A low height test lift should be conducted to confirm lifter function and load stability. The lifter load should be balanced such that excessive point loading does not occur. All lifting should be done is a smooth, even manner to minimize shock to the lifter and load.